New Jersey Gov. Chris Christie and School Commissioner David Hespe sued Atlantic City to protect pay for teachers. But cops won't get paid during the government shutdown. The state of New Jersey is suing Atlantic City to make sure the city's teachers get paid amid a fiscal crisis. Governor Chris Christie said Monday that Education Commissioner David Hespe is suing the city "at my direction" to "protect the property tax collections that rightfully belong to the Atlantic City school district and the children and families that they serve." The city owes the school district nearly $34 million, according to the lawsuit, including a payment of nearly $8.5 million that's due April 15. The city is slated to make a payroll payment of $3.5 million for municipal employees on April 8, according to the suit, but it only had $8 million in cash as of April 1. Christie wants to prevent Atlantic City from making that $3.5 million payment before it pays the teachers. "Now this action won't fix the city's own financial problems," he said, "but it will prevent them from making Atlantic City students and their families collateral damage to their reckless financial gains." A spokeswoman for Mayor Donald Guardian declined to comment. The lawsuit said that without the payment, the school district won't be able to pay for teachers or facilities or for the placement of students with disabilities in private schools. 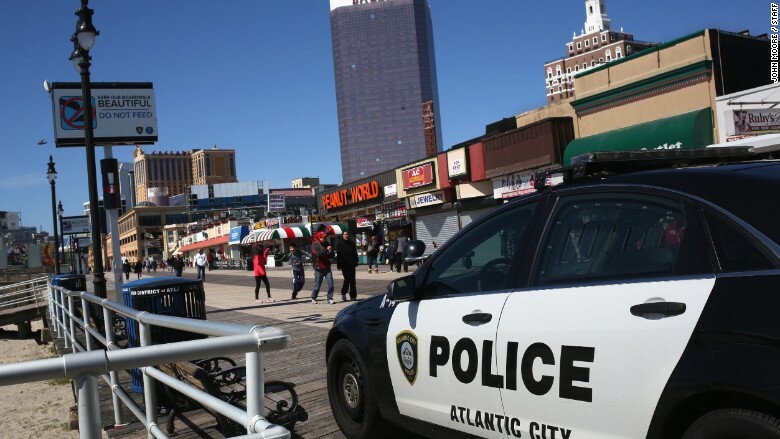 The cash crunch has Atlantic City headed for a shutdown, slated for April 8 through May 2, the day the city receives its next quarterly tax payments. During the shutdown, police officers, fire fighters and other city workers who are deemed "essential," will be forced to work without pay. Local media outlets including the Press of Atlantic City said that workers will eventually receive back pay, though the mayor's office has not confirmed that to CNNMoney. Moody's recently downgraded Atlantic City to a rating that "reflects the greater likelihood of default within the next year" and "significant bondholder impairment," which it blamed on "an ongoing political stalemate over an Atlantic City fiscal rescue package." Christie said Atlantic City now shares the same rating as cash-strapped, debt-ridden Puerto Rico. Atlantic City, which relies heavily on gambling, hasn't recovered from the financial crisis of 2008. Four casinos shut down in 2014, leaving eight left. Also in 2014, Donald Trump successfully sued one of the casinos that bore his name because he didn't want to be associated with it. Trump told CNNMoney that he hadn't even been to Atlantic City "in many years." -- Ahiza Garcia of CNNMoney contributed to this story.